RN, Dip, CHC (DN), BSc (Ed), SPT, PG Cert (Management and Leadership in Health and Social Care), NP, INP. Liz joined the NHS in 1983 and trained as a Registered Nurse at Guy’s Hospital London. She moved into community nursing in 1993 and worked clinically in East Surrey community health care for 17 years with a background in district nursing and nurse education. Appointed as a consultant nurse in 2004, Liz worked across adult health and social care services taking the strategic and operational lead for community IV services whilst holding positions on both PCG and PCT Trust Boards and PCT Professional Executive Committees. In 2009, Liz formed part of a staff ‘Right to Request’ under the Transforming Community Services agenda and successfully created a social enterprise community interest Company providing NHS community services in east Surrey and parts of West Sussex. 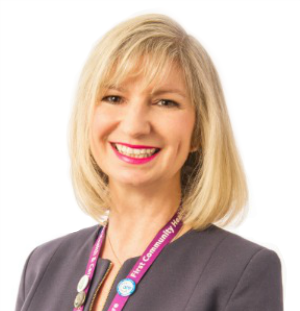 Since creation of First Community in October 2011, she is now Chief Nurse and Director of Clinical Standards taking the lead for patient safety and quality and experience.